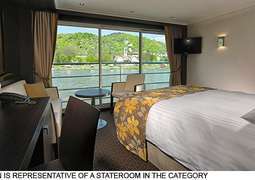 The accommodation on board the Avalon Illumination consists of outside cabins and luxurious suites which all contain the finest furnishings and various amenities to give you the most comfortable cruise possible. There are wall to wall panoramic windows, comfortable beds and duvets with fine Egyptian super-combed linen, an en suite bathroom with a shower, plenty of space in the wardrobes, a flat screen TV, radio, adjustable climate control as well as a mini bar and safe. Dining on board the ship consists of breakfast with a full buffet and eggs made exactly how you want them, a lunch buffet which includes pasta sections and an alfresco Bistro on the Sky Deck. The delicious dishes are taken from the best of Western cuisine, particularly local specialties and use the freshest ingredients. Additionally all drinks including tea, coffee and hot chocolate are available at a self-service area. Various special nights such as the Captain’s reception, Welcome Dinner and the farewell dinner have fine wines and canapés available and call for formal attire. 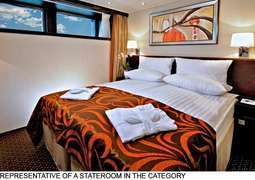 On the other hand you can also choose to eat in the comfort of your own room with the room service option. There are a number of activities on board the Avalon Illumination which you can take part in during your cruise. Firstly, there is the incredible Sky Deck where you can relax on the lounge chairs either in or out of the shade while watching the scenery go by. On the same deck, you have the chance to sit and relax in a whirpool or take part in some deck games with the other passengers. To keep fit during your stay you can visit the fitness centre so there is no need to neglect your routine. Then there are the various onshore excursions which allow you to explore the best of the local areas. To keep in touch with loved ones back home you can use the Internet corner or complimentary Wi-Fi and send photos of your experience during your trip! The dress code on board the Avalon Illumination is mostly casual but the evenings will require more formal attire, especially for the Captain’s Dinner.